After watching Mathew Olsen's appearance at Brookings Institute to talk about ISIS and Al Qaeda in Iraq, Syria and the Middle East, I'm now fully convinced that the United States no longer has the capacity to be a world leader. They are lacking the ethical, moral and intellectual integrity to be world leaders. Mathew Olsen is the Director of the National Counter-Terrorism Center and he is a Harvard-trained lawyer. Somebody should tell these people that the corporate veneer is very thin and in the case of Mathew Olsen, it's completely transparent. You can sell me soap but you can't sell me international and domestic policy. About a week ago, Henry Kissinger wrote an essay that was published by the Wall Street Journal. The title of the Essay: Henry Kissinger on the Assembly of a New World Order. "The concept of order that has underpinned the modern era is in crisis." That's the language of diplomacy. In the language of real people, the world is blowing up. Societies are in chaos, governments are failing, people are dying and governments no longer have the "ethical, moral and intellectual integrity" to be world leaders. They created this world crisis and they are not going to be able to fix it because the considerations of highest priority in their scheming are still in place - and in fact, they are the very ones who are setting world policy that is creating the crisis. Very simply, the order that Kissinger speaks of - is efficient (corporate) management of regional territories based presumably on the theory that the world can be run on the principles of business and that if business runs the world, there will be peace. It doesn't get much more delusional than that. To really understand all of this requires looking at the world - specifically the operation of countries from a functional point of view. Forget the diplomacy, politics and personalities. Look just at organization. 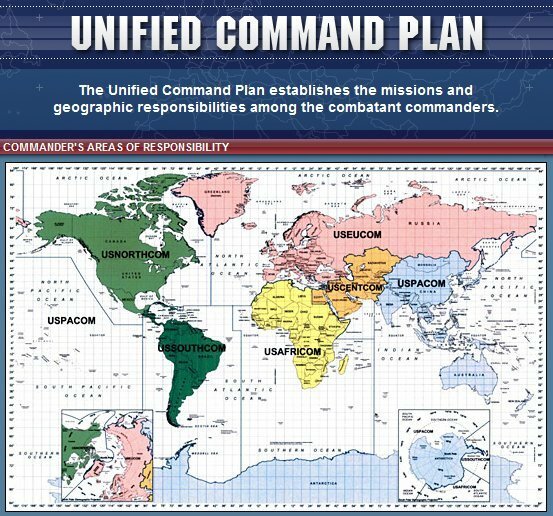 The U.S. and presumably their NATO allies organized the military command structure into regional units. In 1999, Admiral Dennis Blair took command of PACOM - Pacific Command. In 2001, there was a reprint of an article published by the Asian Wall Street Journal (1-19-2001 for those of you who focus on the numerology of globalists), that said that Blair was pushing for the formation of "security communities". "Security Community" is a generalized term for anything and everything having to do with "a sense of security". It is the corporate-speak term for a functional consolidation of the "elements of security" which, in the words of Mathew Olsen - again in corporate-speak, is the cooperation of Intelligence, Military and Law Enforcement. In the real world where we simply say it like it is - Admiral Blair was pushing for the consolidation of police state power across national boundaries to create the global police state for the Pacific Region. Streamlining the secure and efficient movement of legitimate and low-risk traffic across our shared borders. Northern Command and the Security and Prosperity Partnership which come to us in the form of the Department of Homescam Security are the implementation of the global police state organization over the North American continent. Karl Marx called it Dialectic Materialism. In the language of real people, what it means is that when you combine forces across traditional boundaries (including borders), the management of those combined forces rises above the combined forces and the management structures that were sovereign and independent then answer to the higher authority. This is an absolute fact of organization regardless of the type of organization you are looking at. Getting back to the Middle East. The confusion of who we are fighting and who we are supporting becomes clear in the context of the global agenda of creating regional "security communities". We trained the men we are fighting. We supplied weapons to the men we are fighting. The idea for the Middle East was the same as here and in the Pacific - first to create a cross-border, regional military command structure followed by organizing and incorporating the domestic police state structure - the background propaganda of which is to make the world safe for global commerce that in reality, brings prosperity only to a very few at the top of the corporate pyramids and most particularly for the technology corporations who are driving the agenda because control will be achieved through weaponized (computerized), regional control of critical infrastructure. This strategy calls for elimination of borders as is the case for our southern border with Mexico. It's wide open. According to Mathew Olsen, U.S. policy in the Middle East is to provide humanitarian assistance especially between Iraq and Syria where the border has been erased and to provide protection for Americans in the area. This is the policy until they can "transition to government that is more inclusive" of the residents in the area and then they can build capacity and execute a political transformation. A couple of months ago, I took a flight that had a several hour stopover at the Minneapolis Airport. To me, it looked like the entire operation of the airport was a foreign cell operating in U.S. I've never seen so many Middle Easterners in the U.S. and they were all working at the airport. And why would they all be working at the airport? The next layer of the globalization strategy for corporate totalitarian control is in the domestic policy area of transportation hubs as global hubs - aka inland ports which are logical islands separate and apart from the jurisdiction in which they are situated. Our legislators have been very accommodating at opening up our country for terrorist occupation. The global hubs start out as intermodal commerce zones evolving into foreign trade zones and international ports of entry under the management of a fascist Board of Directors "partnered" with local officials who have been organized into regional structures across city and county jurisdictions. 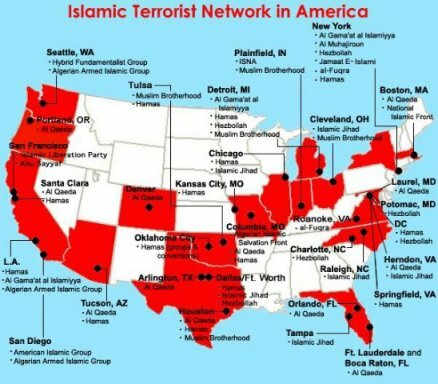 With the assistance of the ACLU, they become sanctuary cities tying the hands of local police to do anything about the foreign takeover - walking occupation of the international zones. And as we heard from Mathew Olsen, Director of National Counter-Terrorism Center, he sees no untoward activity in the U.S. If you hear nothing else in the program at Brookings, that alone should tell you the side of the fence he sits on. Because the globalized system benefits only the very large corporations and in particular, the technology corporations that actually run the U.S. government, there are two tiers to the propaganda. The business tier concerning global hubs is about creating centers (communities) of innovation, global business, etc., etc., The propaganda messaging for people on the internet is sustainable communities - and "intentional communities" aka communes of special interest. Put the concepts of international transportation hubs with intentional communities - or, put another way, "communities of concentration" and the image is horrifying. Recently, I got a link to a story about a Liberty Zone in Honduras. The video tells the story of concept. The location in Honduras makes it easy to see through the strategy. It's the same strategy that is being implemented in the U.S. but because the contrasts aren't so stark, it's not as easy to see here. Taking it a step further, you'll notice that in the video, the speaker talks about how one of the benefits to the residents of the Liberty Zones is that they become stakeholders in the governance of the zone. Outside the zone, they have no access to law and legal remedies to the social conditions in the country while inside the zone - supposedly they do. Carrying forward with the concept of the international zone at a transportation hub comprised of "communities of concentration" under a system of their own law - which in scholarly terms is called Reflexive Law. As Patrick Wood recently pointed out, you'll only find it discussed in scholarly journals and primarily only in German scholarly journals. In a nutshell, Reflexive Law is a system of "self-governance" - but it is not self-governance in the way we Americans think about it. Reflexive law is the legal doctrine that will underpin the international system of global commerce as conducted in the international transportation hubs. 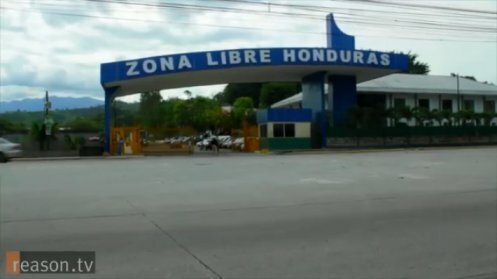 The Liberty Zone in Honduras is a good example of Reflexive Law in practice outside the United States. Inside the United States, it became apparent in the Kelo Decision. That was the Supreme Court case that sanctioned the theft of private property by Phizer Pharmaceutical Company by finding that community benefit outweighed private property rights. Digging deeper into that story, it was discovered that Phizer obtained 24 acres of prime waterfront property for $10.00. They were given a ten year - 80% reduction in city real estate taxes and $3 million a year reduction in sales taxes related to construction costs. The point being that the organization of the corporate-city officials partnership as the sovereign governing authority over the international intermodal commerce zone in New London, CT, applied Reflexive Law to relieve private property owners of their property and the Supreme Court upheld their jurisdiction for it. The conditions for the Liberty Zone in Honduras and the Phizer Zone in New London were different, but the application of the doctrine of Reflexive Law operates the same. The above is a vertical slice of the New World Order strategy - global to local. What enabled the transformation of the U.S. government from an American government to a functional system of privatized corporate management, was the Reinvention of Government project carried out by the Clinton Administration between 1992 and 2000. Bill Clinton came into power through the Democratic Leadership Council (DLC). The DLC was an insurgency within the Democrat Party. The "Third Way" policies that Clinton implemented were the policies of the Progressive Policy Institute (PPI). The PPI was a creation of the founder of the DLC and the funding for it was provided by a Zionist mobster. And you can pick up the research from there.